Berlin-born Hans Richter - Dadaist, painter, film theorist and filmmaker - was for four decades one of the most influential members of the cinematic avant-garde. Richter assembled some of the century's liveliest artists as co-creators of Dreams That Money Can Buy , his most ambitious attempt to bring the work of the European avant-garde to a wider cinema audience. Among its admirers is film director David Lynch. The DVD includes an exclusive alternative soundtrack by London-based Baroque pop band The Real Tuesday Weld, with narration by Brazilian chanteuse Cibelle and English alchemist David Piper. The band has previously performed this soundtrack live to accompany screenings of the film at the NFT in April 2005 and at Tate Modern in May 2006. 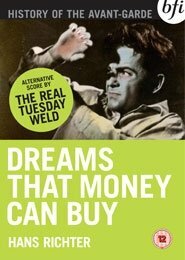 Dreams That Money Can Buy is part of BFI Video's A History of the Avant-Garde series, which features the best of radical and innovative filmmaking from the first hundred years of cinema.